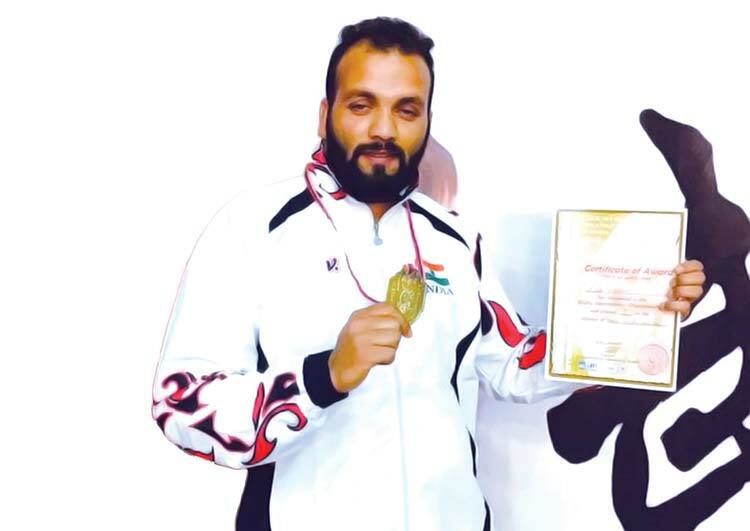 Ajaz Hassan, 27, a resident of Aloocha Bagh in Srinagar, has played twenty-five nationals in a different category of martial arts. Recently Hassan clinched a gold medal in Wu –Shoo International Championship in Armenia. In 1999, Ajaz, then 9, joined Wu-Shoo classes at Indoor Stadium, Srinagar. “I dedicate myself to learn the game,” says Ajaz. Next year, Ajaz played district championship in Wu-Shoo in Polo Ground, Srinagar and won a silver medal. “It was my first achievement,” said Ajaz. Same year Ajaz played his first state-level championship in Jammu and again won a silver medal. This win helped Ajaz get selected for the national championship. In 2002 he played his first nationals in Jabalpur and won a bronze medal. Meanwhile, Ajaz tried his luck in other types of martial arts like Kickboxing. In 2006, he won a gold medal in an international championship at Mumbai. Ajaz, who has spent most of his life in a rented accommodation, recently shifted to his house after his father got a loan on his pension. In the same year, Ajaz got an invitation for participation in Wu-Shoo Federation Cup. “The trials were held in Jammu. I was selected. I won the two bouts and clinched the bronze medal,” Ajaz recalls. In 2016, Ajaz was selected to participate in International Championship of Wu-Shoo in Hong Kong. “It was postponed and shifted to Armenia. But I had no money to cover my expenses,” recalls Ajaz, who needed Rs 1.50 lakh. After four months training in Delhi Ajaz flew to Armenia.